Well, it had to end sometime… NotCouture’s launch week is drawing to a close. But not before we hook you up with one more discount! 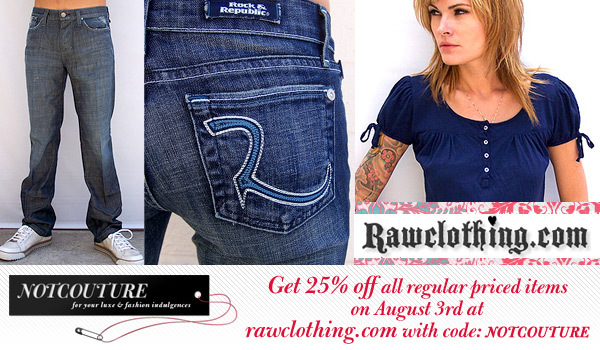 On Friday, August 3rd starting at midnight (pacific time) you’ll be able to save 25% off all regular priced items at Raw Clothing with the code: NOTCOUTURE. Of all the stores featured, notcot and I have a more personal experience with this one because their physical retail space is actually in San Diego, where we met in college. (Aww…) Here you can definitely get your fill of jeans and tshirts (the cream of the crop, of course) . Think of this as our way of helping provide you with some clothes for a nice, laid back, summery San Diego-type weekend. Dunno what I’m talking about? Check out some of our picks below after the jump! Also! A reminder: We’ll be picking the winner for our Kasil giveaway this Friday night (August 3rd)!! You have until just before midnight (like, 11:59:59 PM on Friday) to enter the contest!